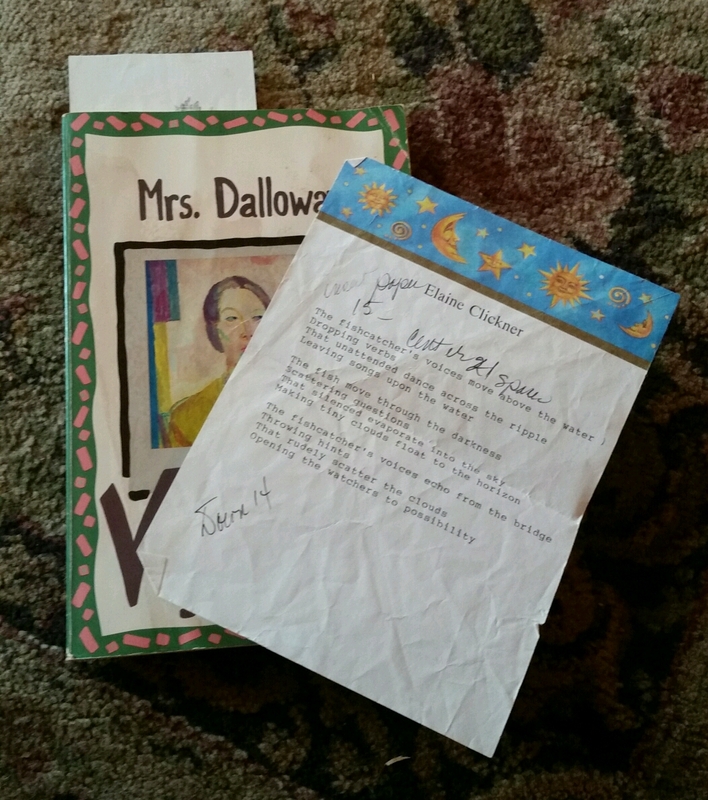 "In the strangest of places..."
I pulled my old copy of Virginia Woolfe's book, "Mrs. Dalloway" from the shelf and watched as two pieces of paper fluttered to the floor. Curious, I retrieved them, and found an untitled poem written over 30 years ago. Leaving songs upon the water. Making clouds float to the horizon. Opening the watchers to possibilities. I remember the day I wrote those words. The sun was warm, the breeze cool, and autumn sat upon the trees lightly. Younger versions of my friends and me, climbed on the rocks and dangled our feet in the water that flows beneath the old covered bridge. A good day. The other much smaller bit of paper is a rubbing made at the Viet Nam memorial marking the spot dedicated to my cousin. I haven't been in D.C. since '86. I wonder why this isn't filed with all my other genealogical info. I start to think about that war but shove the thoughts back, I don't need to go there. I wonder how these disparate bits from the past became bookmarks. It's fun and interesting to me to discover stuff that makes me wonder. Wow, talk about finding two treasures. I liked the poem, by the way. Thanks, it took me back to a sweet place and time. What a lovely poem! And on such cool stationary. It's nice to find stuff like that in unexpected places. TY, I loved that stationary, alas all gone now. E, What amazing finds! And I especially love the line "...Dropping verbs/ That unattended/ Dance across the ripples/ Leaving songs upon the water." That is just utterly gorgeous! I'm ever so pleased that you like that line. Funny, I used to carry a notebook everywhere to jot down bits of this and that. Like so much else, that has fallen away. E, Interesting about the notebook. I started carrying one for that purpose when I was in college. I remember standing in line at the cafeteria jotting things down on a little notepad with spiral binding across the top. And taking it with me to the waiting room at the industrial temp agency where I worked between semesters. Also used steno pads, for some years after that, when being able to cram it into a shirt pocket was not an absolute necessity. My daughter has come across boxes of both in the attic of the house we're now clearing out. Always thought I'd get back to them someday, mining for whatever inspirational gold I might find. Now, I feel like I'll be lucky--or somehow miraculously inspired--to even get back to doing that with my LJ and DW accounts which are ever so much more accessible and, hopefully, relevant. In the meantime, I'm trying to focus frequently/long enough to read a few short Wiki articles on Ms. Woolf whilst I await the arrival of my highly secret and illicit stash of books, lol. I just hope I can muster the concentration/focus to read them once they get here. I don't have an accessible attic, but I do have some boxes filled with journals and lately I keep finding snippets of writing here and there like the poem in this post and another in the recipe box yesterday. Virginia lived an interesting life or it seems so to me, even her dramatic demise spoke to me. Eating receipts, *guffaw*...that's an inspired comment and damned funny to boot. Lovely poem. A treasure. I love finding little memory joggers. Thanks, agreed it's fun to find memories. I am always sticking things in books so I discover lots of hidden treasures.